I'm still working on earning all my stickers, and creating a major was one of the few I've got left to earn. It's always best to stick to what you know, so I created a major based on what I'm in college for, Product Design. (It's actually called Industrial Design, but if you try saying that to the average person they start thinking about factories and assembly line layouts - which is *not* what we are talking about.) Product Designers are the people who design the products you use every day, from your cell phone to your computer to your car to your toys and furniture. We also do packaging and entertainment designs. 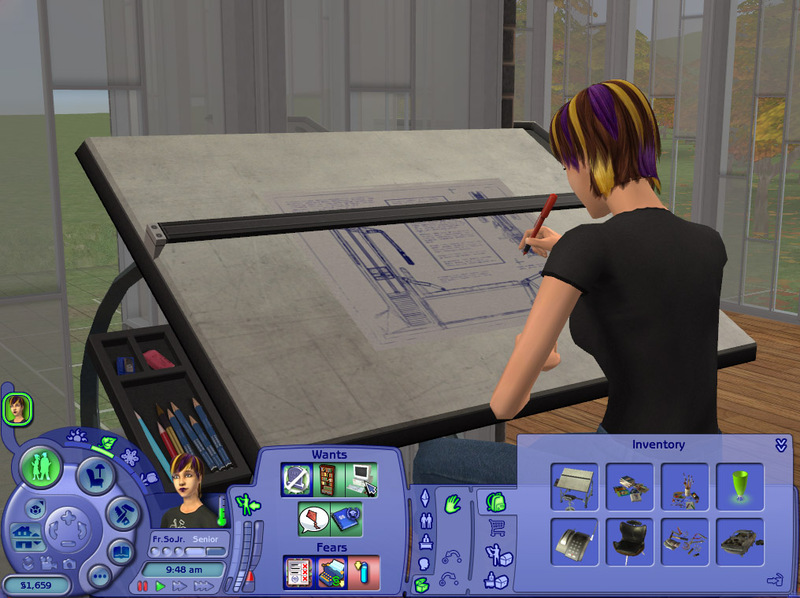 Some industrial designers go off into entertainment design and create Sims games for us. If you have FreeTime, I've got an extra special surprise bonus for you. It always seemed so strange to me that you didn't need to buy supplies for college and when you graduated all you had to show for it was a diploma. I'm only a semester away from graduation myself and let me tell you, I've accumulated probably a couple thousand dollars of art supplies, office supplies, furniture and home goods from my apartment, and completed projects. 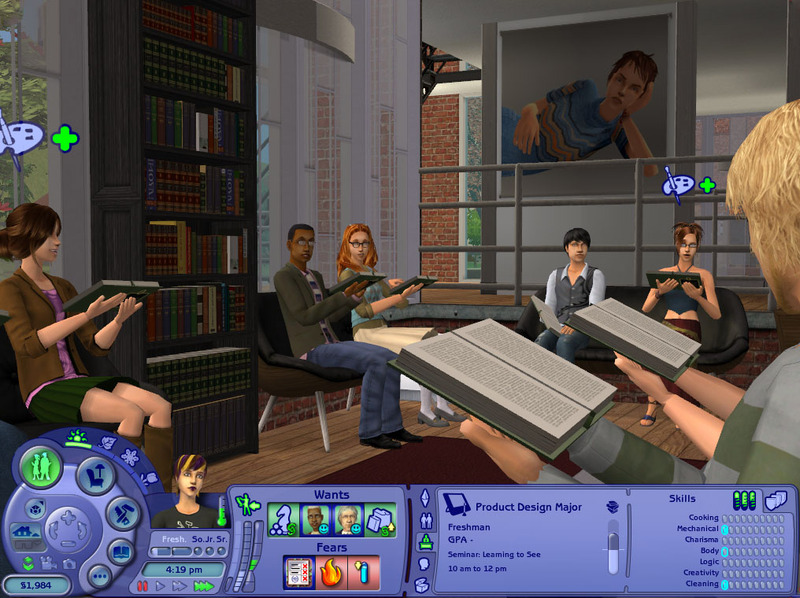 To mimic this, after each completed quarter a new object will appear in your sim's inventory. Sometimes its school supplies, sometimes its completed projects. You could sell them off, but your sim has 'earned' these objects. Take them out and outfit your 'studio' with them. 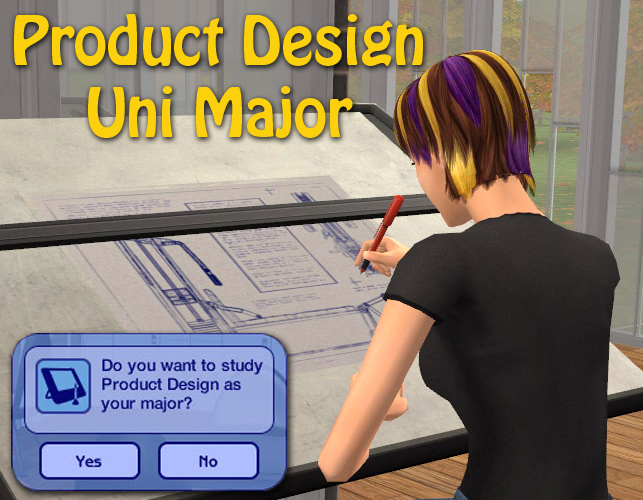 After graduation, your sim should get a job in Architecture, Artist, Business, or Slacker. These are the closest thing we've got to a Designer career path. Product Design: knowing what looks good and why, and how to create things that people will want. You will need to use FrikaC's Majors Made Easier mod; custom majors do not show up in the normal major selection window. You may clone this to get the inventory code, but you MUST clone it properly and assign it a new GUID so you don't overwrite my major. Please see whiterider's tutorial on how to make a major. I cloned this from the Business major and then changed it to Art by changing one of the BCONs - General Tuning I think. That changes which icon appears above their heads when they are learning. Creds to Echo and xiaoyun for helping me bunches!